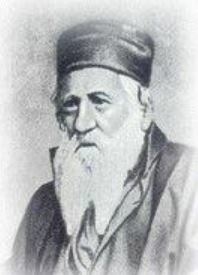 Yehuda Aryeh Leon Bibas (1789-1852) was born in Gibralter to a long line of Sephardi rabbis. After his father’s untimely death, the young Bibas moved to Livorno to be raised by his grandfather. There, he studied both at the yeshiva and the university, becoming a rabbi and physician. He returned to Gibralter to head its yeshiva, attracting many students from across Europe and North Africa. In 1831, he was appointed chief rabbi of Corfu (a Greek island that had a large population in those days). Over the next decade, he understood the terrible predicament that Jews were in, and resolved that restoring an independent Jewish state in the Holy Land was the only solution. In 1839, he embarked on an international tour to encourage Jews all over the world to make aliyah. Some credit him with being the first prominent figure to do so in modern times. He was supported by the great Moses Montefiore, a wealthy Sephardic Jew who financed the first printing press and textile factory in the land of Israel, refurbished many of its Jewish holy sites, and established several Jewish agricultural colonies. It was during Rabbi Bibas’ global tour that he met Rabbi Yehuda Alkali (1798-1878). Rabbi Alkali was born in Sarajevo and studied in Jerusalem under the tutelage of the holy city’s greatest Kabbalists. He went on to become the chief rabbi of Semlin, Serbia. Partly inspired by Serbia’s own nationalist movement, and further spurred by an 1840 blood libel against the Jews of Damascus, Rabbi Alkali was convinced that Jews must have a state of their own after meeting Rabbi Bibas. Rabbi Alkali established the Society of the Settlement of Eretz Yisrael and began a campaign to encourage Jews to settle in their ancestral home. Based on a famous prophecy in the Zohar, Rabbi Alkali proclaimed that the year 1840 would be the start of the process of Redemption, and that it would take one hundred years to accomplish. In an incredible prediction, he said that if Jews failed to take advantage of this spiritually-auspicious century, then by 1940 the Redemption would begin anyway, but in a much more difficult way, and only through “an outpouring of wrath will our dispersed be gathered”. History has eerily confirmed his prophecy. More amazing still, Rabbi Alkali published a book in 1857 titled Goral L’Adonai (“Lot for the Lord”) which clearly outlined the steps to re-establish a Jewish state in Israel. He presented one of the first copies of the book to his dear friend, and a member of his Semlin synagogue, named Simon Loeb Herzl. This happened to be the grandfather of Theodor Herzl, who would inherit the book. Scholars agree that Rabbi Alkali and his 1857 treatise played a major role in influencing Theodor Herzl, and thus the whole Zionist movement. In fact, it was Rabbi Alkali who first proposed restoring Hebrew as the primary spoken language of the Jews, who argued that the Holy Land should be legally purchased piece by piece, and that Jews must re-learn to become agriculturalists for the whole endeavour to work. (All three of these things would soon materialize.) Both Rabbi Bibas and Rabbi Alkali practiced what they preached and made aliyah to Israel. Rabbi Bibas first joined his disciples in Yaffo, then moved to Hebron and opened a library. He passed away shortly after, and is buried in Hebron’s Jewish Cemetery. Rabbi Alkali, meanwhile, founded a settlement near Jerusalem and lived there for the remainder of his life. He is buried in Jerusalem’s Mount of Olives Cemetery. Did You Know These Famous People are Sephardic Jews? It was a city of wonders. Everything was written in Hebrew. People were speaking Hebrew. I thought, This is redemption. This is the city of the Messiah. This entry was posted in Extraordinary Individuals, Religious Leaders and tagged Aliyah, Bosnian Jews, Corfu, Gibralter, Hebrew, Hebron, Herzl, Holy Land, Israel, Jaffa, Jerusalem, Kabbalah, Kabbalist, Livorno, Montefiore, Prophecy, Proto-Zionist, Redemption, Sarajevo, Semlin, Sephardic Chief Rabbi, Sephardic Jews, Serbia, Yeshiva, Zionism, Zohar on June 27, 2018 by Jew of the Week. David Wolffsohn (1856-1914) was born to a poor, religious Jewish family in the Lithuanian-Polish town of Darbenai (then part of Russia). His father was a Torah scholar and teacher, and Wolffsohn, too, was learning in yeshiva with the same goal in mind. In his teens, he was sent to live with relatives in Germany to avoid being conscripted to the Russian army. There, he met the rabbi, philosopher, and early Zionist leader Isaac Rülf, and became his devoted disciple. Meanwhile, Wolffsohn took up secular studies and went on to apprentice at a trading company. In 1877, he started his own flouring business, and was soon one of the most prominent Jewish businessmen in Europe. Henceforth, he dedicated his life to realizing that ancient dream of his people’s return to Israel. 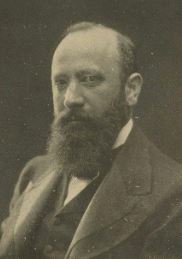 He played a key role within the Hovevei Zion movement, and in 1894 was a cofounder of the Society for the Promotion and Support of Jewish Agriculture in Syria and Palestine. When Herzl’s The Jewish State was published two years later, Wolffsohn immediately journeyed to Vienna to meet him. The two became very close and traveled the Holy Land together, setting the foundations for what would become the State of Israel. Not surprisingly, when the World Zionist Congress was founded, Herzl was made its president and Wolffsohn its vice-president. Upon Herzl’s death shortly after, Wolffsohn succeeded him. As president, he was instrumental in reinvigorating Jewish life in the Holy Land (among other things, it was under his tenure that the city of Tel-Aviv was founded). However, Wolffsohn is most famous for being the one who created the flag of modern Israel. Back in 1896, Herzl had written: “We have no flag, and we need one. If we desire to lead many men, we must raise a symbol above their heads. I would suggest a white flag, with seven golden stars…” Herzl’s proposal was good, but his flag gained little support. Wolffsohn responded to Herzl thus: “We have a flag—and it is blue and white. The talit with which we wrap ourselves when we pray: that is our symbol. Let us take this talit from its bag and unroll it before the eyes of Israel and the eyes of all nations…” Wolffsohn designed a simple flag with blue talit-like stripes and a star of David in the centre. The flag caught on quickly, and the rest is history. The traditional design of the talit inspired the modern flag of Israel. This entry was posted in Business & Finance, Law, Politics & Military and tagged Flag of Israel, Herzl, Hovevei Zion, Lithuanian Jews, Orthodox Jews, Russian Jews, Tallit, Tel Aviv, The Jewish State, World Zionist Congress, Zionism, Zionist on March 14, 2018 by Jew of the Week.